Did you know holy week is in the stars? The date of Easter is not fixed, but instead is governed by the phases of the moon – how pagan is that? Or is Easter even more ancient? All the fun things about Easter are actually pagan. Bunnies are a leftover from the pagan festival of Eostre , a great northern goddess whose symbol was a rabbit or hare and are symbols for fertility and sexuality. It truly emphasizes creation Exchange of eggs is an ancient custom, celebrated by many cultures. Eating boiled eggs was also a custom in the medieval times to honor the time after the dark winter months. Hot cross buns are very ancient too. In the Old Testament the Israelites baking sweet buns for an idol, and religious leaders trying to put a stop to it. The early church clergy also tried to put a stop to sacred cakes being baked at Easter. In the end, in the face of defiant cake-baking pagan women, they gave up and blessed the cake instead. The general symbolic story of the death of the son (sun) on a cross The Southern Cross or Crux. The Crux is also known as the “Southern Cross.” Crux, or the Southern Cross is a constellation in one of the 12 signs, and these signs all have meaning and influence on collective consciousness. The constellation of the southern cross and his rebirth, overcoming the powers of darkness, was an ancient story from an ancient world. There were plenty of parallel, rival resurrected saviors too. I was speaking with my son Myles the other day as we were preparing for his 7th birthday party on Sunday and we happened to pop onto the subject of death. Now If I were speaking to my 12 year old daughter it would have been a very emotional and heavy conversation but Myles and his light hearted spirit just said "but mommy we don't die". I asked what do you mean. He said "we just go into another world, and another world and the worlds continue on forever"
"We go on through our heads" and continued on in his play. I am not sure about you, but I would love to believe this pure hearted boy knows a thing or two about the spirit world. Many mystical teachings focus on this Holy week of death and rebirth. 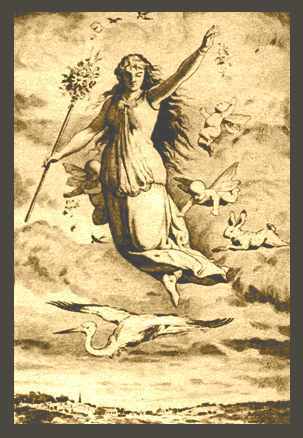 Easter comes from Ostara, otherwise known as Ēostre, and is the Germanic goddess of spring and dawn. Both Christianity and Judaism (Easter Celebration and Passover) are inherently linked. There are deeper, underlying commonalities that join the two holidays. The theology of each, in its own way, celebrates liberation. Both holidays are joined at their core in finding us rejoicing in the defeat of death and the gift of life restored. The April full moon is also quite symbolic for this week. The Pink moon in Libra and like the last moon it is all about Balance and Love, Love for another and love for ourselves. We have to learn to love ourselves. We have to learn to know our worth. And when we do, our relationships will have a way of automatically following. Under the energy of this potent Libra Full Moon, ask yourself where you can love yourself more? Ask yourself what relationships are no longer bringing out the best in you? I found this mantra many years ago when I was running SOUND (Center for Arts & Mindfulness). SOUND was the first healing arts center that opened its doors the day after the Sandy Hook Shooting in Newtown CT. And I was the Founder. Unbeknownst to me the vision and place I had been working diligently to create first in my imagination and then in the material plane was to be a center of great solace and healing in my town and the surrounding towns. The idea of SOUND came in 2010 in a dream I had where Beethoven visited me in a chapel and encouraged me to bring sound and music to help serve others (I will write more about that in another blog). After listening to my soul and following the breadcrumbs from the universe, 2 years later my ex husband and I bought an old chapel renovated it and it became the home to SOUND Center for Arts & Mindfulness. One day two very gifted healers were using the Ho'oponopono for a group healing and suggested I record a version because there were really not a lot of good ones out there. So my task was set. I created a version of Ho'oponopono that I would like to listen to and meditate with. The particular music is tuned to the earth and the harmonics I chose to compose with are very healing vibrations. The Magic Power of the Sacred Ho’oponopono - How to Use it to shift your world. Ho'oponopono is an ancient Hawaiian shamanic practice for healing. Ho'oponopono means to make (ho’o) right (pono) right (pono) to correct relationship problems. Most problems and negatively in our lives come from stuck energy either in this lifetime or past or even our ancestral lineage. Once honored and recognized many times situations can dissipate organically as love and forgiveness are high vibrational emotions. Traditionally a kahuna or doctor would be called into a family to uncover the problems, practice forgiveness and release each other from the negative family dynamics including but not limited to guilt, shame, holding grudges etc. “I’m Sorry, Please Forgive Me, Thank You, I Love you”. With pure intention and an open heart deep forgiveness would occur and celebration would ensue. When practiced on others then on yourself, with reverence and consistency, Ho’oponopono could change your world in rapid and dramatic ways. And this can be done silently in quiet meditation and best of all - it’s absolutely free. There is a deep history with this sacred practice but has been made more mainstream with Morrnah Nalamaku Simeona. Morrnah was a healer and went around the island teaching small groups, hospitals, even the UN this practice, and in 1983 she received a great honor by being designated as a living treasure of Hawaii. Dr. Hew Len a university trained physician was a student of Simeona (albeit skeptical at first) Dr. Len decided to use this practice while he was the staff psychologist for Hawaii State Hospital overseeing high security unit housing male criminally insane patients from 1984 till 1987. He used the Ho’oponopono mantra and devoted his time to this profound healing practice by using the files of each inmate. Three years later the spirit and order in the psychiatric unit was greatly improved and eventually the whole unit was closed because the need organically dissipated. People were healed and released or moved into other non-violent wards. Dr. Hew Len was healing deep aspects of himself or his subconscious made conscious with the words, “I’m Sorry, Please Forgive Me, Thank you, I Love you”. Use this mantra for the intimate relationships you have in your life. Find a quiet space and bring forth your partner, spouse, family members or friends and say the mantra in your head until you feel a subtle shift on your inner place. Continue to practice daily while you witness a change in your reality. If you are a witness to an car accident, an argument or you are in a toxic environment. Repeat this mantra and bring yourself to a neutral point. Please note: While you may use this mantra for anything and everything staying in toxic and abusive situations are never wise. So be mindful and grounded and bring this sacred seed of love and forgiveness into your world. When we decide to turn on the light it can make it much easier to clean our inner house or subconscious mind in the light of love and forgiveness than the dark of ignorance. When I would give presentations to parents of incoming students or workshops on SOUND and music I would start with “If there was only one subject to teach in schools it would be music. Music encompasses EVERYTHING” Those who put down the arts or deem it less worthy than science, technology or business and refer to extracurricular activity or a hobby obviously don’t get it all. Beethoven said “Music is a higher revelation than all wisdom and philosophy” and I agree. In simplest terms, not only does music teach math, spatial reasoning, structural analysis, kinesthetic awareness, listening and literary skills, healthy expression, coordination, self discipline, time and energy awareness. But it also stimulates brain connectivity that does not occur in any other subject area. Left and right brain activity happens simultaneously according to recent scientific research and brain scans show the corpus callosum, a massive bundle of nerve fibers connecting the two sides of the brain, is larger in musicians. When learning to read notation, memory increases, superior multi-sensory and processing and problem solving skills are birthed, critical thinking, an increase in executive functioning, heightened ability to communicate, processing and decoding become evident. If that’s not enough to convince anyone that learning to play an instrument or sing is most likely the most valuable skill set. Let me share this; music comes from another space all together. Unlike science, math, technology, reading, writing and other subject areas music is the highest art form it is beyond logic. Which means when a musician plays and sings they are communicating directly with their soul and beyond. They are accessing an altered state of consciousness. Music is an inherently spiritual art form. The emotional intelligence of a musician is higher than non musician and they can have an adept way or ability to “feel” and move through their emotions creating resilience and increased awareness of the whole. Playing music can help alter mood too. It can help with anxiety, depression and can actually assist the brain to heal from trauma. Music creates community and connection and can make you authentically happy while not being dependent on anything outside of you. Music can reach places nothing else can and connects you directly to your heart. In our day and age there are many technologically made sounds and music today, but it pales in comparison to a human creating the music him or herself and making the vibrations. We are human tuning forks and we have the capability of learning our inborn technology from when we are young. We are made of energy and music, which is vibration in structured organized form, is the most profound and impactful way to learn to harness the energy you are made of. Below are 3 easy ways to bring music into your life daily. Listen to something different every day. Find a genre of music you would not normally choose and expand your musical taste buds. Dance- Move to your favorite song. What Does SOUND have to do with it? What do the brilliant minds of Greek mathematician and philosopher Pythagoras, Baroque composer J.S Bach, and Swiss psychiatrist and psychologist Carl Jung have in common? They share deep understanding that music and sound connect humans to the earth and beyond. Sound healing and sound/music therapy are growing increasingly popular these days as an alternative way to deal with a range of “dis-eases” from chronic pain to ADHD to depression and more. Sound and music is currently being welcomed as a tool to assist healing in hospitals, schools, nurseries, birthing centers, rehabilitation facilities and retirement communities around the U.S. and Europe. Tibetan and quartz crystal singing bowls, tuning forks, gongs, didgeridoos, drums, rattles and other instruments are being utilized to help patients and clients go beyond relaxation and into a place where the body and mind are receptive to balance and, ultimately, healing. “When properly mobilized, sound can specifically entrain the human organism toward the greater harmony and homeostasis that it requires to remain vibrant and to regenerate after injury or illness. The properties of sound medicine—entrainment, harmony and homeostasis—represent the rational and spiritual foundation for a new movement in the healing arts and sciences,” according to Mitchell Gaynor, M.D., the late integrative oncologist who was passionate about using sound to help heal his patients with cancer. This might be a new movement in the Western world but music and sound used as a tool for healing is deeply rooted in ancient cultures and civilizations. Schools of ancient Egypt and Greece considered healing and sound a highly developed sacred science. The flute and lyre were used to treat illnesses such as gout and sciatica. When illness set in, Native American shamans used their own voice in healing rituals by singing to themselves to facilitate healing. Creating light through vocal harmonics was utilized by Mayan shamans. Hindu Ayurvedic medicine and traditional Kundalini yogic practices have used the breath-chant combination to balance the energetic centers and cleanse the subtle energy body for thousands of years. In early Christianity, Gregorian chants used certain melodic and harmonic structure that helped prepare for accessing a heightened state of divine awareness and power. The common denominator in all of the ancient healing wisdoms is the knowledge and understanding that humans are beings of vibration. Everything vibrates; it is vibration that we see, hear, feel and experience on our earth journeys. When our bodies are ill, when we have chronic pain, depression and anxiety, it is our bodies’ way of telling us we are not in vibrational harmony. Is “dis-ease” a physical manifestation of stored pain, trauma, emotional blockages or deep conditioned thoughts and beliefs that need to be brought to the surface, attended to and released? How does sound and music help to attain whole being healing? When body and mind are given the proper tools for energetic release and vibrational alignment, the body can then heal from the inside out instead of a pharmaceutical drug masking a symptom of the “root” cause. Use of Tibetan singing bowls can bring brainwaves from alpha to theta, which creates a deep state of relaxation, harmony and balance. Because of the multiple harmonics, the sound can have the effect of bringing both hemispheres of the brain into synchronization. Sound can be the medium that transports a person to an elevated state of consciousness. Through journey inner clarity, peace and the healing knowledge can be attained. When the body is allowed to be in a non-resistant mode, “ease” not “dis- ease” can begin. Gongs have been used for more than 4,000 years; attending a gong bath is a powerful method for reducing stress and breaking up emotional blockages. The gong creates a profoundly relaxing ocean of sound that activates the parasympathetic nervous system to balance the over-amped, over-taxed sympathetic nervous system. “The sounds from the gong travel from the outer ear throughout the body via the vagus nerve, impacting brain waves, respiratory rates and heart rates. Sound enters the healing equation from several directions. It may alter cellular functions through energetic effects. It may entrain biological systems to function more homeostatically It may calm the mind and therefore the body. Or it may have emotional effects, which influence neurotransmitters and neuropeptides, which, in turn, help to regulate the immune system—the healer within,” says gong master and Kundalini yoga teacher, Don Contreaux, who is in his 46th year of gong healing and teaching. Whether you sing to yourself, chant sacred chants or tone your chakras, the ultimate sound healer can be your voice. Its resonance is as unique as your fingerprint and extraordinarily powerful while raising your vibration. It is said that while chanting, the tongue connects with meridian points on the roof of the mouth. These points are connected to areas in the brain that can result in chemical changes that bring about a more balanced psyche; strengthen the immune system; and promote mental, physical and emotional health. One of the interesting things about mantra chanting is that it works even when the chanter does not understand why. Sound healing, when practiced by caring, supportive and educated practitioners with the highest intentions, can be tools for profound healing. In the end, these sacred instruments can allow each of us to tap into the ancient wisdom within our bodies, and connect to our intuitive knowledge and higher self. They can bring us back into alignment while raising our individual and collective vibration. When emotional, spiritual and physical bodies are in accord with each other, illness fades, pain disappears, and the divine path shines bright. Cacao Ceremonies are SO healing. As a priestess I love leading them for so many reasons. Once cacao enters the body I see magic happen. A sparkle in the eye, a smile, a tear and even giggles. The beautiful plant wants to connect with us and heal our hearts of lifetimes of trauma and past on fears. Cacao offers us a way to be more joyful and let go and connect back to our GOD Center. Find your Bliss ( Get Happy With Cacao) -Some days you just need to find your bliss – cacao is one of the healthiest foods you can consume. Cacao contains the mood improver, anandamide – known as the bliss molecule, which creates a feeling of euphoria. Plus it's loaded with theobromine, found to halt coughs better than codeine or commercial cough suppressants with the equivalent of two cups! It Puts You "In The Mood" Another mood-enhancing compound found in cacao is PEA or phenethylamine, which triggers the release of endorphins and pleasurable opium-like neurochemicals. These often release naturally when we fall in love and during sexual activity. (The only other food on earth that contains PEA is blue-green algae.) In addition, these chemicals improve libido, which is probably why chocolate is so popular on Valentine's Day! Helps To Keep Mood Swings At Bay Cacao boosts brain levels of serotonin, the feel-good brain chemical. When women are experiencing PMS serotonin levels drop dramatically. The benefits of cacao are proven to boost the brain levels of calming hormones and restore feelings of well-being. Protects You From Heart Disease Flavanols are an anti-inflammatory and heart-protective antioxidant group found in cacao. Studies show they can protect against cardiovascular disease, reduce the risk of stroke, and help improve blood circulation! Cacao contains over 700 compounds and the complex antioxidants found in it known as polyphenols help reduce ‘bad cholesterol’ and prevent hardening of the arteries. Helps To Improve Brain Function Cacao appears to improve cognitive function and prevents Alzheimer’s! A Harvard study by Dr. Gary Small, showed that middle-aged people who drank two cups a day had improved memory and increased blood flow to the brain. Helps To Prevent Signs Of Premature Aging. Polyphenol antioxidants found in cacao belong to the same group of antioxidants as green tea and red wine. These anthocyanins (found in dark colored fruits) and catechins (found in green tea) protect our cells from premature oxidation or destruction and can keep us looking and feeling younger longer. Energy Boosting Naturally! Mineral-rich cacao energizes the body without over stimulating the nervous system, giving you incredible long-lasting energy! Create loads of energy and combat fatigue with one of the highest concentrations of magnesium found in this natural food source. Magnesium also helps to protect against osteoporosis, reduces type II diabetes, and lowers blood pressure. Raw cacao powder (2tbsp) contains 52mg or 14% of daily value. Beauty Food- Shiny Hair skin and nails. Get shiny hair, strong nails, and take care of your liver and pancreas with this great source of sulfur. Sulfur has a significant impact on our complexion, hair and how our skin glows. It has the ability to continuously build and rebuild collagen and keratin which is important for hair, skin and nails to get their shine whilst also playing an important role in driving nutrients into and out of cells, blood sugar regulation, tissue repair and our immune system. In 2006 the Journal of Nutrition found that women who drank cacao with at least 326 mg of flavonols a day had better skin texture, improved microcirculation, increased oxygen saturation, and improved skin hydration than those didn’t. Metabolism boosting. A Swiss study found that in just under two weeks cacao reduced the stress hormone cortisol, improved metabolism, and even improved gut microbial activity. Not getting enough antioxidants in your diet can have dangerous long-term health consequences. Better than Fluoride for teeth! Recent studies from Tulane University discovered that an extract of cacao powder was even more effective than fluoride in preventing cavities. This crystalline extract similar to caffeine helps harden teeth enamel! It's Nature's Aspirin! The Department of Nutrition at University of California, Davis, discovered that cacao thins blood and can prevent blood clots. This finding shows that cacao can be just as beneficial as taking an aspirin a day. 12 years ago after my daughter was born I contracted Lyme disease and Ehrlichia chaffeensis a severe and rare tick borne infection that can be fatal especially when untreated. I was postpartum with a c section and went undiagnosed for close to a year. Because I was a new mother, I had nothing to compare it to. I thought every new mother was just very tired and the myriad of MDs told me- to just go home and sleep. And because "I looked fine" doctors had a hard time filing me in a diagnostic box. As time went on, the infections nestled deep within my nervous system, muscular system and joints. Causing severe pain, heart arrhythmias, memory loss, word retrieval issues (for the most simplest of words such as “chair”) and sleep paralysis. Imagine being fully awake and not being able to move your body. Shooting pains in my elbows would not allow me to sleep at night and my nerves would twitch and buzz like I was electrified. But one of the most notable moments came when I forgot how to read music. The musical staff that I had been a staple in my brain since I was five years old meant nothing to me. I couldn’t understand the symbols. It was if my entire life’s work was blank. But I could “feel”. At that point my life consisted of pain, daily physical, mental and emotional pain. And every fear you can imagine showed it’s face. This went on for almost 2 years. Those years I lived my greatest nightmares which eventually became my biggest gifts, although going through it felt much more like a living hell. The physical, mental and emotional suffering was palpable but because nothing else was working I slowly started to learn to listen and trust my own body; and it became my temple. During those years I committed to healing myself from the INSIDE out. I could only concentrate for a short time due to headaches and Lyme induced anxiety which guided me to a daily practice of meditation. For a year I only walked on cement for fear of getting bit again which in turn allowed me to acknowledge my fear of death and uncertainty. Facing myself daily was interesting and difficult. Why was I unhappy? Why did I allow mistreatment from my partners? Where did the drive for achievement and perfectionism come from? Why did I have an immense amount of energy and creativity and what the hell am I supposed to be doing with it all? I was already teaching 600 students a week with a choir of 200. I went to Juilliard had a Masters Degree with an equivalent to a Phd in everything else I have studied. I was an athlete, had a nice house, new baby. Why couldn't I just BE? What was I really afraid of? It was as if I was having a mid life crisis at 32. Or was it? I was overstressed, overworked and overburdened and totally unfulfilled. THIS was my awakening. Playing Beethoven’s Sonata No .8 at that time seemed like a distant memory. In the quiet recess of my mind I had much music to write. I hadn’t composed in over 10 years and it was time for my voice to be a heard again. I didn’t NEED the symbols to write from my heart. Sound is SOUND. I remember the day I finally surrendered, on my knees in the laundry room on a pile of dirty clothes. I vowed to become an instrument of service to this earth. To use my gifts of creativity to heal and uplift others, because I so desperately wanted to be healed and uplifted. From that place forward I have continued to grow, learn, adapt and not accept status quo. Even if everyone else was doing it. I had never been a follower in my youth and it was time I remembered who I was and become who I was meant to be. I learned to be true to myself because my life (and health) depended on it. Today I create music for love, I sing for enlightenment and live for joy, freedom and compassion. I help others because I know how it feels to suffer to be hurt, lost and alone. And I also know suffering is indeed optional Joy is our Divine birthright. And being human is downright difficult sometimes. Everyone is working on something. Next month I am releasing new music. A symphony for the soul I wrote in 2010. It is a Sonic Journey that includes sound healing, chakra balancing, toning, high vibrational frequencies, brain altering sound waves, technology to reprogram our subconscious mind with a focus on the strongest biological electrical and magnetic field in the human body. And my friends it is NOT the brain. So thank you for reading this Very Long Post. But I believe as humans when we act from a place of love, kindness, compassion and a bit of vulnerability at times it reminds us we are ALL connected by the virtue of being human; and humility is indeed grace. We might have different levels of consciousness but every human heart is equal. Being curious about the darkness within and allowing parts of our shadow side (our wild, intuitive, creative and primal nature-sometimes dark) to be seen and integrated is paramount to our evolution individually and collectively. We are POWERFUL beings, We CREATE positively or negatively but we are ALWAYS creating. And the more powerful you are the bigger the creations. And sometimes mine were not always beautiful.